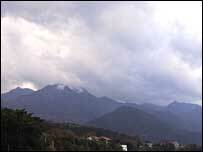 The blue sky seemed to vanish in an instant, as wild, grey thunderclouds raced across the mountains. Rays of sunlight broke through in places, brightening spots in the forest like searchlights. There are few landscapes more dramatic than Yakushima, and few places with more weather; within seconds we were being pelted by our 12th rainstorm of the day. But none of this bothered Sachito Fujimoto, one of Honda's top engineers. "It's the perfect climate for us," he said with a grin, and we climbed into the dumpy little blue car he was testing. The Honda FCX isn't much to look at, but it's the closest thing to a genuine car of the future you can drive on public roads. Underneath the bonnet - and under the passenger seats as well - is a revolutionary fuel-cell engine that produces no pollution and, in effect, runs on nothing more than the enormous amounts of rain that fall on Yakushima. Which is why Honda has chosen to test it on this remote southern island - a Unesco World Heritage Site better known for its sheer mountains and ancient forests. Fuel cells don't run literally on water, but on hydrogen, which is forced through membranes inside the fuel-cell stack, producing an electric current that powers the car. You can make hydrogen from water, but that also requires electricity - and it so happens Yakushima has abundant quantities of that, too. 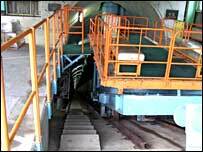 The reason lies 170 metres (yards) down a steep tunnel, which takes you deep under the mountains, on a funicular railway. That is where the local electricity company has built turbines to harness the enormous hydro-electric potential on Yakushima - and it has done that so successfully that it produces far more electricity than the island's 15,000 inhabitants can use. Surplus electricity cannot be stored, so the company has joined forces with Kagoshima University and Honda, to make hydrogen for the fuel-cell FCX. So some of Honda's top engineers have to spend several weeks a year on the island, running the FCX along its twisty mountain roads, and putting up with the endless rain. "Actually it's a very good testing ground," says Mr Fujimoto, "we want to show that our car can perform well in all kinds of extreme weather conditions". It doesn't hurt the car-maker's image, either, that it is associated with one of the most pristine natural environments left in Japan. Hiroshi Ishii, the president of the electricity company, has grander dreams, of an island entirely powered by renewable energy. He pulls out a colourful leaflet showing how the hydrogen could fuel all the cars, buses and boats on the island. It could even, he thinks, be shipped to a neighbouring island where Japan's space programme is based, to power its rockets. For the moment, though, this is just a dream; his main customer is still Honda. 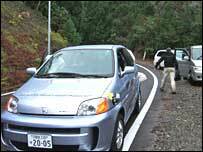 The people of Yakushima have now got used to seeing the little blue car swishing silently around their island. It is an impressive machine, with surprisingly good acceleration for a car that runs on water. The technology is still too expensive for mass-production, but Honda has loaned other prototypes to city governments and individuals in the United States, in the hope that one day, they may be the first to produce a truly affordable fuel-cell car. And the islanders, who are very proud of their World Heritage status, say playing host to such a clean-living car, seems quite appropriate for Yakushima.